People in the bakery are important, and so are our relationships with people we work with outside of the bakery. A particularly appealing aspect of our work is having the opportunity to work with artisanal producers from all over the world and learning how to make their traditional recipes. Sometimes we even get to host them in Ann Arbor. The Mahjoub family from Tunisia makes olive oil, couscous, harissa, and a variety of Mediterranean vegetable and fruit spreads. Their couscous is so fantastic that we regularly order a 10-kg (22-lb) container of it and share it among ourselves. On one visit, Majid Mahjoub and his wife, Onsa, taught a class at BAKE! featuring Tunisian special ties. 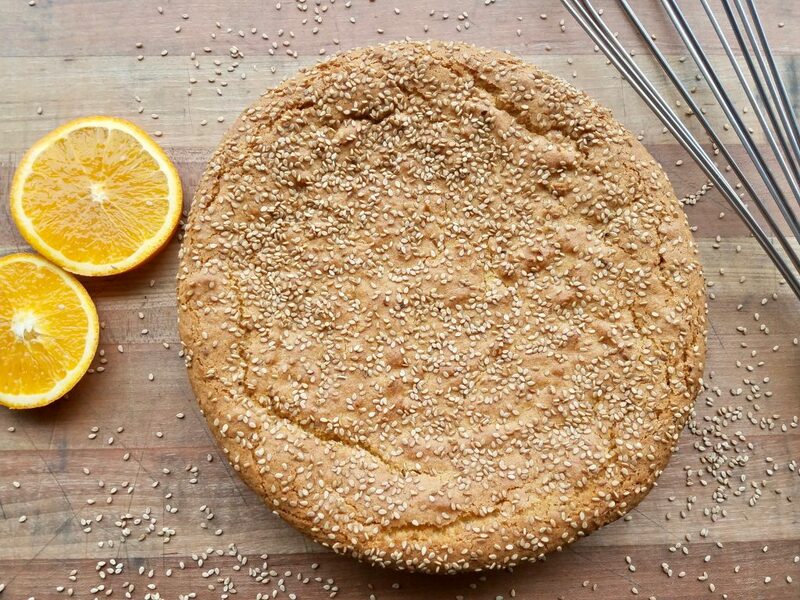 For dessert Onsa prepared this simple but characterful cake featuring their olive oil, fresh oranges, and sesame seeds. It’s perfect with coffee or mint tea. Preheat the oven to 350°F [180°C]. Spray a 9-in [23-cm] round cake pan with nonstick cooking spray. Wash the orange and cut off both ends. Cut the orange into quarters and put into a food processor, peel and all. Process until the orange is a pulp. In a large bowl, crack the eggs and add the sugar. Use a whisk to combine, and then beat until light and smooth, about a minute. Add the orange pulp and olive oil and whisk to combine. In another bowl, combine the flour, baking powder, and salt. Sift the dry ingredients into the orange mixture and stir gently until all the ingredients are combined. All the dry ingredients should be moistened. Spread the cake batter into the pan and sprinkle it with the sesame seeds. Bake for 35 minutes, or until a toothpick inserted into the middle comes out clean. Remove from the oven and let cool completely before removing from the pan.